How does one go about starting a community garden? Or find a job at an urban farm? Or learn how to compost? Or find like-minded bee enthusiasts? The answer to these questions more often than not ties its way back to Advocates for Urban Agriculture (AUA). AUA is a non-profit whose mission is “to support and expand sustainable agriculture in the Chicago area, from home- and community-based growing to market gardens and small farms”. AUA achieves this through advocacy, information assimilation, and building it’s growing network of >2,300 members. 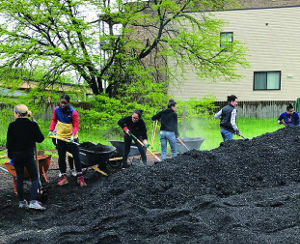 AUA’s strong network is probably its biggest asset in helping to integrate urban agriculture into Chicago. Take for example, Laurie Ouding. Laurie is a pediatric nurse on the South Side and after witnessing the increasing rates of childhood obesity and type II diabetes, she decided to do something about it. She’s in process of launching One Village, an ambitious ~10,000 square foot mixed-use space intended to provide fresh, local, and affordable food and the education associated with it for the farmers and residents around the Bronzeville neighborhood. The plan includes a marketplace, 3 classrooms, office space, a shared commercial kitchen, and an additional 4,000 square feet of green space. When Laurie had this idea, she started by reaching to AUA’s list-serve. From there, she sourced 20 farmer vendors/small business owners and was connected to Jonathan Pereria, the Executive Director of Plant Chicago. Jonathan provided Laurie with guidance and a letter of support she needed for funding sources and to campaign the City of Chicago for a grant to jump start the project. AUA’s impact has ranged from the intimate - supporting the $1,500 microgrant of an outdoor cooking pavilion at a community garden - to the substantial - its annual Urban Livestock Expo that brings >300 people from all over the city to Englewood to teach community members about livestock and showcase the Southside Occupational Academy. Did you know that today Chicago has >350 school gardens, >250 community gardens, and >50 urban farms, along with ~4,000 residential gardens? How all these components of Chicago’s agriculture get started, get help, and continue to grow is often tied to the little publicized AUA. The AUA has even helped us at Apologue! They connected us to Growing Solutions Farm, an urban vocational farm run by Urban Autism Solutions located in the Illinois Medical District who we were able to contract with to grow Celery Root for us for our Celery Root Liqueur. Creating these types of win-win community relationships is something we’d like to raise a glass to - here’s to you AUA for being the unsung hero of Chicago’s urban agriculture movement!